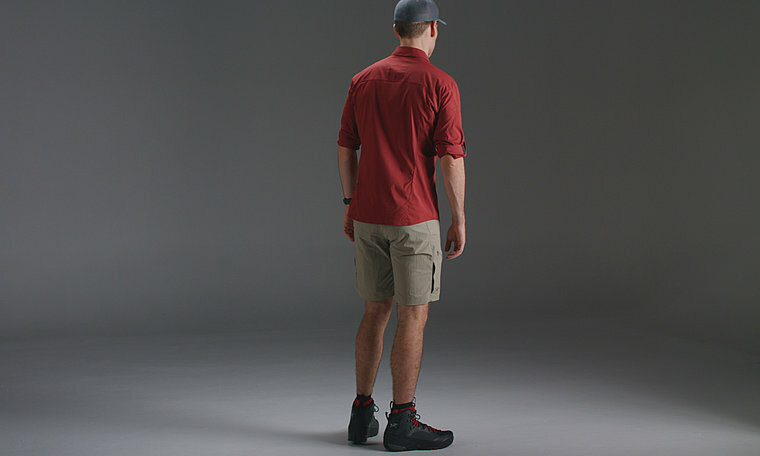 Tough, light, technical nylon short delivers air permeable, quick drying comfort for hiking, trekking and backpacking. For technical hiking, trekking, durable and protective designs for remote and varied conditions. The Palisade Short combines technical fabric, purpose driven features and ergonomic patterning in a design specifically geared for the trail. Light and durable, TerraTex™ is a durable nylon blend geared for warm weather hiking and trekking. It provides sun protection, dries quickly, allows airflow and delivers stretch performance. Comfortable, moisture wicking brushed polyester lines the waistband for comfort in warm weather and under a hipbelt, and the integrated webbing belt secures the fit. As a component of the Arc’teryx Traverse collection, the Palisade Pant aligns with Arc’teryx footwear, packs and apparel to create comprehensive systems for extended backcountry trips. Function defines the Palisade’s form. The trim fit is streamlined to minimize excess fabric that can get in the way while bushwhacking or on a narrow, steep trail. Articulated patterning and a gusseted crotch deliver ergonomic freedom to help handle steep grades and shifting terrain. Pockets are carefully selected and placed for efficiency while on the move with a pack on. Streamlined cargo pockets secure with a low profile laminated zipper and have a volume pleat for more effective storage of larger items. Slash hand pockets provide simple, easy access to small essentials. Hiking and trekking products balance weight and durability to give the right protection for the specific needs of each adventure. Longer length and heavier fabrics give more protection. Shorter length and more air permeable fabrics allow for more comfort during warm weather hiking and trekking. Fits close to the body. These garments are patterned with lower volume for reduced bulk. Most compact, little room for layering. Allows for layering and freedom of movement. These garments use complex patterning and shaping to enhance motion and eliminate excess bulk. Has room for maximum winter layering. These garments rely on both articulation and higher volume patterns to provide comfort and mobility.